The pressure was no less intense when Race Day dawned on the Riviera. Team Goulian initially missed out on the Final 4 by less than a quarter of a second and had begun packing up, only to be informed that they were advancing to the last round after all, due to a disqualification ruling. The team scrambled to get their Edge ready for takeoff, Goulian took a deep breath and jumped into the cockpit… and then he pulled off a remarkable third-place result. Next on the calendar is, of course, Chiba, with its incredible Air Racing superfans. Home expectations will certainly be high for Japan’s defending World Champion Yoshi Muroya, but what about the stress at the top of the leaderboard for Team Goulian? Because the raceplane was shipped directly from Cannes to Chiba, the team did not have access to make modifications, but given the global scope of the sport, that’s not an unusual situation. They focused on track analysis and physical fitness, and also had numerous opportunities to meet media, fans and supporters. 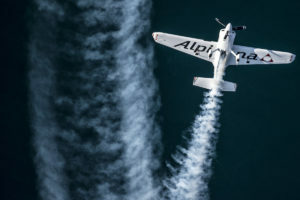 Goulian was featured as a native son in a Boston Globe story, the team visited the Swiss home of their sponsor Alpina, and they spent two weeks working with Goodyear Aviation, including flying in Florida at Pompano Beach as well as Tampa, where Goulian performed a display with the Goodyear Blimp. Wherever they went, the encouragement was overwhelming. Photo courtesy Red Bull Content Pool.